Tentation is a modern variety from France, derived from and very similar to Golden Delicious. 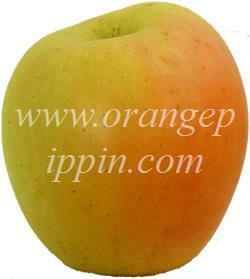 The appearance is quite striking, being a light golden green apple with an attractive orange flush. Blushed apples are increasingly popular with supermarkets - in appearance Tentation is quite similar to Pink Lady, except it is flushed orange rather than pink. As with many modern commercial varieties, marketing and promotion are almost as important as flavour. Tentation is being marketed in particular to female customers. Tentation was developed in 1990 by the famous Delbard nursery in France, and is a cross between Golden Delicious and Grifer. The flavour is supposedly very good, described by one supermarket as "strong and deep" but by the originators as "delicate". The examples we have tried could best be described as pleasant rather than exceptional, with the underlying sweetness tending towards blandness - pretty much what you would expect from an apple that is in most respects a Golden Delicious. However it is early days for Tentation, and growers and supermarkets are still learning about it. There is no doubt that it looks appealing, and interestingly the orange flush seems to be more prominent in examples coming from the southern hemisphere. Not seen many this year but have had these in the past and they have a great flavour, sweet to start then tangy and really crisp. Great tasting apple. A chance purchase from M & S and a lucky one! Thin-skinned, crisp, very juicy with a slightly perfumed flavour that reminds me of the Kidd's Orange we grow in the garden. Much better than most Cox's Orange Pippins I have eaten over the past few years. I shall definitely be eating this variety in future and unreservedly recommend it as a dessert apple. I liked the Tenation apple well enough but thought the Envy apple was better. I bought both at the same time in the same store, ate them a day apart. I didn't like the tough skin on the Tenation but did like the crispness, juiciness and flavor. Just like the last few commentors I Googled for an apple, a First. finished consuming my first Tentation. Like very much. Now tell me, anyone, where can I get a Belle de Boskoop ? Just sampled 'Tentation' purchased from Waitrose today, which are grown in Kent. I confess I googled the variety before tasting and my heart sank...'derived from Golden Delicious'...oh dear; oh dear me! But I was pleasantly surprised. It is crisp, very juicy, slightly aromatic, quite sweet, and not at all bland. My wife liked it more, but I still prefer Cox, or locally-grown apples. Sadly, we've just run out of the latter so Tenatation is now on the menu! It certainly beats the plastic Galas Braeburns and dreadful 'Pink Ladies' from overseas hands down. All in all I give Tentation 7/10. Also the first time I've ever Googled the name of an Apple, also from New Zealand, tasted really good, great texture and crunch. Just. Wow. I work at The Produce Exchange in Minneapolis, and we just got these in yesterday. I had never heard of them (very surprising, since I grew up with a produce manager for a mother). When I asked my boss what they tasted like, he said "unusually tropical, if that makes any sense". Looking at them, they didn't seem very interesting, and they didn't smell particularly amazing. But I bought two ($2.49lb!) and I'm eating one right now. AMAZING! I really love Honey Crisp and Lady Alice apples, but this is pretty spectacular. It DOES seem a little tropical to me! Kind of apple/lemon/pineapple-y. Yes, pineapple! How weird! But delicious! I've only had these twice, last spring, from one supermarket, while visiting my mother in London, Ontario. I thought they were outstanding ! Fabulous flavour, beautiful colour, and they certainly don't remind me of of Golden Delicious in any way at all. One got lost in the fridge drawer and was every bit as good two months later. Nice and firm, but not rock hard, I can hardly wait to see more of these ! just tasted these-UK grown-sold by M&S, very impressed-pronounced pear drops flavour which combined with good bite & sweetness is a winning combination-tastes nothing like golden delicious which are tasteless. I first saw them yesterday. only 1.69 pound. (Our grocery prices are amongst the lowest in the country) Before I bought it the produce man let me try them. I don't think they taste at all like a Pink Lady. But, yes, they were really good, tangy/tart/sweet, ours came from NZ. I agree with most of the commenters that the apples were tasty--but at $2.69 per pound, I think I am just as happy with Gala or Delicious apples. They weren't really all that unique like a Honey Crisp or other rare variety. I tend to agree with the general pleasant flavour mentioned by all, but I think that a little more credit as to the depth of flavour should be given. The apples I purchased today were the first I have had, and were lovely in Apple Crisp. I have not eaten one out of hand, but I will happily use this variety for future pies etc. Good texture, and a nice balance in sweetness and tartness. I bought these at a Supermarket in KC. OMG.they are simply delicious! I actually was surprised how good they are. They weren't cheap, but the flavor is wonderful. Definitely will buy them again. @ Mary, they can be found at the Jewel on Lake St. in River Forest. They have had them for the last several weeks. They are simply delicious! I first tasted this "extraordinary" apple two years ago. Purchased at our local Jewel Foods. Haven't been able to find it again anywhere ! Can someone tell me where to purchase them now ? I live in a suburb west of Chicago. Any info greatly appreciated. Thanks. I eat 10 - 12 apples a week. I sent my wife to the store to buy more Golden Delicious Apples. Later that day I got an apple to eat and noticed that it was a little harder than before. When I took a bite, WOW!! The tast was out of sight. I hope that they are in season year around. Tried a sample of this apple in our HEB, and my daughter and I went back for 7 or 8 more tastes! We are, unfortunately, notorious for letting fruit spoil in the refrigerator. But not these!! Everyone in the family LOVED the sweet tart taste and couldn't eat them up fast enough! Tasted these beauties last year, because they looked so luscious, and now I am completely addicted. I eat at least 2 per day, and when hubby is around you can just forget it. Lovely color, tart, tangy, crisp and sweet. The best apple I have ever tasted. Pity it is around for just a couple weeks in June. I am buying about 2 dozen per week; pricey, but worth every penny. I hate to keep a secret, but they are featuring at Loblaws. You may find some if I haven't already scooped them up. Insanely Delicious! This apple has been made into a cider by Nigel Kitney of Lower Eggleton in Herefordshire, the cider is available from www.realdrinksofengland.co.uk. I have not tried the apple but the cider is great. Bought the tentation apple from Foodtown on the Hibiscus coast in NZ. I love apples that are crisp and tasty. Tentation makes my mouth water just thinking about them - they are crisp, juicy - with a bite to it, and would now be my favourite apple. Good for eating as well as cooking. Would appreciate it if anyone can tell me when they will be back on the shelves in the NZ supermarket. I thought the Jazz apples were the best apple I ever tasted. This beats them. Very firm apple, with a hint of lemon juice. Delicious. Best tasting apple...EVER!!! Almost makes me think of a pear when I'm eating one. Best apple I have ever had. Bought at target Super Store. The sign in the store says it was grown in New Zealand. Off to the store for more today. Yes, a good bite and balancing sweetness, but short of the subtle & lingering flavours of a good Russett or Worcester Pearmain. Bought one at the local market. Hard, crisp, and very, very tart, but with the Golden Delicious flavor underneath. If Golden Delicious and Granny Smith had a love child... Very juicy, though, and an attractive apple. I wonder if they are all similar, as I did not seem to have an apple with as balanced a taste as mentioned above. Picked too green? More expensive than other varieties available now. @Glenda from Southern Oregon In Southern California I found them at my local grocery store (Stater Brothers). I haven't been able to find Tentation yet. Last year found it in Safeway. What stores have you all been finding it in??? Very tasty apple but won't replace my favorite Pink Lady. eating one right now that has a new zealand label on it .. made my mouth really pucker ,, very juicy ,, a serious sweet/tart thing going on ! Fantastic apple! I stumbled across small display at our local HEB store and bought one. My wife cut it up after I brought it home and we both enjoyed it. I love the sour taste and even while typing this review my taste buds went crazy. Beautiful color and consistent flesh. Mark, I totally agree. These are awesome. My faves for the past couple of years have been Honeycrisp, but these are right up there as a contender for my preferred variety. I will be heading back to HEB tomorrow! OMG simply delicious. If they are this good being in cold storage at the grocery how incredibly great they would taste if they were freshly picked from the tree! I feel a batch of homemade applesauce coming soon from these apples. Pretty apple. It tastes like a Golden, but with some crunch/pressure to it. Won't replace the Jazz in my fridge though. By far the best Apple I have ever eaten. A little tart, and not soft! Most excellent indeed. The one I just scarfed was from New Zealand purchased at HEB here in Houston.. Good Job Kiwi's! I work in the produce department of a supermarket, and a lady came in and told me how good the apples were... I had to buy one and I just tried it. They taste amazing. I bought 2 of these apples just to try them and regret that I did not buy the whole lot of them. These are by far the best apples I have ever tasted. The ones I tried were from New Zealand and now the closest thing I can find are the New Zealand Jazz. They are good but the Tentations are exceptional. The growers in New Zealand seem to think that these apples are best eaten as soon as possible after they are picked maybe the ones that were "pleasant rather than exceptional" were not fresh enough to fully appreciate. I will buy these again if I can find them. I tasted my first Tentation apple a couple days ago, and loved it! It was crisp, firm (I don't like soft apples) , juicy and sweet. Perfect! It seems that the person who wrote about where and when the apple originated, may not actually eat apples. I just purchased more a few minutes ago. My 5 year old Daughter and I sampled these apples at our local supermarket and, she is a fussy fruit eater but cannot get enough of tentation apples!! I can quite honestly say they are the best apple Ive ever tasted. "The examples we have tried could best be described as pleasant rather than exceptional, with the underlying sweetness tending towards blandness -" Excuse me I don't know what apple they tried but it was not the same one I tried. It was a one of the BEST apples I have ever had. Complex flavor, tartness and sweetness just wonderful. I will be getting some more. I'm a produce manager for a local grocery chain, and this apple is fast becoming one of the most popular varieties we sell. Excellent flavor and texture, with the perfect balance of sweetness/tartness. You should be able to buy Tentation at Loblaws in Eastern Canada from June - likely to be in their stores around Ontario - not sure if they will be available out on the Coast. Glad to hear that you like the apple. Crisp and delicious. Amazed it comes from the ubiquitous and over-rated Golden. Where did you buy the tree? I picked these apples while travelling in New Zealand. Ate almost as many as I picked, they were delicious. You couldn't even buy them in the supermarkets in NZ, they were all shipped back to France. They were a real pain to pick as they bruised very easy, but it was worth it. If I ever see them on the east coast of Canada I would be very excited. I really do want to get some scion wood for this variety. Can anyone out there help? I am passionate about a good apple. I first tasted Tentations when I was in London, visiting my mother. Last year, I was delighted to find them at my local Fresh Market in Memphis for an all-too-brief period. Worried that the same thing would happen this year, I purchased as many as I could get into my second refrigerator. They are amazing, up there with a good Golden Russet for me, surpassing all other apples in texture and flavor. Crisp, sweet, tart, amazing flavors melding into a delightful whole. They become delightfully wizzened as they age, retaining their crispness and intensifying the amazing flavors. I am hooked. Wish they were available for longer periods but not at the expense of becoming mealy and nondescript. Absolutely delicious. The best apple I ever had. Can I plant a tree? Just found these for the first time in the local supermarket. Absolutely fantastic - crisp and sharp. I do hope that they do not go the way of so many apply varieties which become widely available - bland and soft. I just had some Tentations from Waitrose, the first time I've tried this variety of apple. The moment I bit into it I had to text my wife to tell her it was the best apple I'd ever had (mind at £2.50 for 4 you'd expect something special). The flavour is so complex, hinting of things like caramel and ginger to me. I normally had Braeburn or Pink Lady, but those pale compared to this. Having read on here that people think British grown ones are better than New Zealand I'll have to keep my eye out for some. Some nutjob I work with never stops talking about this freaking apple...Having now read your comments I'll have to go out and try some. I found this apple at Safeway. Great flavor and crispness. I am not fond of the Delicious apples, but this one was great. I discovered this apple a month ago and think they are the best tasting apple there is with only one exception (Jonathan apples top my list). I hope I can find them year round! These apples are awesome. I just biught a few from Jewel a few days ago. Best apple buying decision I've ever made. I like these much more than I like the Gala, Cameo, Fuji, Red Delicious, Golden Delicious, Jazz (yes!!) and pacific rose. A total surprise and totally delightful. Bravo to the creators of this variety!! My son calls "mom I just had the best apple I've ever tasted" . Two weeks goes by and he comes back into town with the best apple I've ever had, somewhere between a pear and realy sweet apple. He bought these in Leavenworth County Ks. Where can I find a tree and grow my own? I purchased only one and cut it up. My eldest could not believe how good it was and because I had never seen them before I went back to the supermarket to get more. They are worth the money. The most delicious apple I have ever eaten. I just bought this at Jewel today. It is absolutely delicious!!! Thrilled! This time of year I find all apples to be HARD, and poor flavor. Continual disappointment for an apple lover. But I just found this apple at Marsh. Tender, sweet flesh, with no mushiness, and no granular leftovers. I agree on the hint of cherry, and also find a bit of pear-like quality. Fabulous! Now all I need to do is find it in the South Bend area, where I live full time. Any guidance? Maybe the best apple I have ever tasted. The first taste you get is a delicious sweetness, which then turns into a tartness as you keep chewing. I want another one so bad right now hehe. Best. Apple. Ever. There was cinnamon. There was sweet. There was sour. All depending on where you bit. If there were such a thing as magical apples, this is what they would taste like. I love this apple because it's easy to bite into, has a softer texture without being mushy and it doesn't taste like an apple. It's like a whole new fruit. Oh, and it's very juicy. Wonderful and delicate all at once. The best: as grower of old English aromatic apples, that cannot be produced commercially, I am amazed by the quality. I am another one of those who discovered this apple in Waitrose about 2 years ago. I am not an appple fan but fell totally in love with this one, I hate flabby, mealy apples, but this is seriously crisp, sweet, juicy and very aromatic. I managed to buy a maiden from a local nursery winter 06/07 we only had 3 fruit last summer but this year the tree is dripping with fruitlets!! I have been searching the web for information about this apple. I live in Sacramento California and here we are used to many varieties of excellent apples. Last fall a local grocery chain had Tentation apples for a short while. My family loves to try different varieties of apple, so I bought some. They were exquisite. I went back to the store and bought the rest of their meager supply. All were eaten within 3 days. These apples have a subtle cherry-like undertone to the flavor and a lovely crisp texture. I've asked my local grocer purchase more but they haven't been able to get any. Any suggestions on how I can find a grower or supplier locally? That I have remembered the variety name and have searched the web for information about them is a testament to how good I think they were! Tentation are simply the best - thank you thank you thank you Mr Simpson and Mr Chantiler. My only problem now is that I cannot get out because of an operation and Ocado (Waitrose home delivery service) do not stock them ......... what will I do for the next 3 weeks without Tentation? I first discovered this apple around five years ago whilst shopping at Waitrose in Salisbury, with my son and my husband. I was immediately attracted to the wonderful perfumed aroma that these apples emitted. it was also the first time that I tasted before buying (I did ask the shop assistant first..lol), and all 3 of us were really blown away by this great tasting variety of apple. It is our favourite variety, but they tend to be far tastier during the autumn. I have told all my friends about it, however that could have been a mistake...less for me...lol. A great tasting apple. Highly recommended. After discovering these in Waitrose about a month ago, I am hooked! I went back today and bought the remaining stock on display. fantastic apple - I'm so glad they are grown in England. Thank you Rob Simpson. One of the best apples I have tasted in years! Hard to believe it originated in France whose apples generally are pretty tasteless and lacking in texture. Bit disappointed. Looked lovely in M & S, quite bright yellow. Nice and crisp but rather boring taste. Could have been a bit sweeter really. Ill stick with the fantastic Pink Lady. I am completely addicted to this fantastic apple. I eat a variety of fruits daily and have found no other fruit as fragrant and sweet as this. Surely this was the apple Eve had! Tentations taste as good as they look. We have bought and enjoyed them, while they are available, for the last two years. I have been a huge fan of this apple since I first tasted it five years ago. It is a lovely appearance on the shelves when other english apples are beginning to be past their best. The british climate really seems to bring out the best - examples from new zealand often seem slightly bland in comparison to british ones. The flavour is, admittedly, not complex, but the sweetness does not overpower the fresh lemony acidity, and the whole apple is sublimely aromatic, smelling almost of quinces - heaven (a fantastic natural room fragrancer!). The flesh is crisp and wonderfully juicy. Whatever the breeders were trying to create - a pink lady/golden delicious type sweet apple to grow in colder climates perhaps - seems to me they failed, but praise the heavens they did, cos this beautiful apple is streets of ahead of those. Buy all you can! This apple is amazing. I am not a huge apple expert. I occasionally will get a taste for them, as today when I bought this "new" type of apple. The tentation is definately the BEST variety I have ever tasted. It is sweet like a Golden delicious but more crisp and tart like a granny smith. Awesome eating experience!!!! Just bought tentation apples in M&S today. It was the first time I had seen them. They looked appealing, and the taste was superb. I will certainly be buying them again as I find it very difficult to obtain apples that are as good as this variety. I must agree with Mr Green that these Waitrose English Tentation apples are superb.